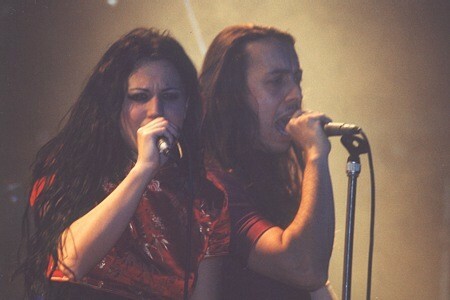 I had  few questions for Lacuna Coil and used the chance to talk to the Italians at Wacken 2001. I first talked to singer Andrea Ferro (male singer) and later Cristina Scabbia answered a few questions as well. Andrea, what do you think about your performance here in Wacken? We are really happy because there was so much people, we never played in front of all this people, I was like 20,000 people, was amazing, you'll see the end of people, so we are really satisfied. Festivals are always fun, but here it was great. I think we have some gothic elements, but is not like classic gothic metal, we try to mix something we really like heavy music, sometimes more atmospheric, sometimes more aggressive, we really try to mix, so it's not only gothic. The next album we will really have some heavy songs, it will be also a mix for the future, sometimes more into pop, sometimes more into heavy metal, and sometimes a bit more gothic. From where did you get the idea to combine a female singer with a male singer? Many bands have done that for only a couple of songs like Dark Tranquillity, and also many black metal bands use to invite a female singer but only for a song, and you do that in all songs. We just like to use to contrast between aggressive male vocal with the female atmospheric voice of Cristina, we also like do a full vocal song with something melodic, and sometimes we do a full aggressive song, we like to play a lot with the voices, that's our trade mark, the combination of different kind of vocals and we'll keep on doing it. Any plans for touring in South America? We would like to come very soon, we played last year in Mexico two gigs with Theatre Of Tragedy and we loved Central America, we also want to go to Brazil, Argentina, Venezuela, Chile, so we want to do as soon as possible a South American tour, may be the next year with the new album, we can do it, it's a big desire for us. You are representing one of many other bands from this new heavy metal wave from Italy with bands like Rhapsody, Skylark, Power Symphony. I don't if you remember the wave of progressive bands from Italy the conquered the whole world and now in the 90's there was this wave of metal bands considered the second most important movement of rock in your country. What do you think about this new wave in which your are taking part? I'm really happy because the scene us growing, not only Rhapsody and Labÿrinth are coming out, a lot of different bands are coming, many new bands are coming too, so it's really important because it tells a lot of the scene it's growing in Italy, because when you go around you can have a challenge with the other bands and see what's going on all around so it's really important to keep on supporting the metal scene in Italy, I think there are more bands to come with a good chance to be know all around. Cristina, let's talk about your influences. Which are your main influences and which are your favorites female and male singers? I don't have a real influence, because there are so many singers I like but no one in particular, talking in general I love black voices, not black metal, I'm talking about R&B and soul stuff from Aretha Franklin and all the soul and R&B female voices. You take influences from many styles of music. Yes, probably I'm just inspired by myself, because I'm not use to be inspired from other people, and the voice is something so special, you know. You cannot have another voice similar to yours, so you can just be inspired by yourself. What do you think about other female singers that right now are in heavy metal Michela D'Orlando of Power Symphony, Tarja from Nightwish? I always think that every voice have something special, so I will never judge another voice, even if I don't like it, because there is always something special. I personally respect all the singers you mentioned and I'm happy that now the female scene is growing. Thanks to both of them for answering my questions. No interview was scheduled with them and they were so nice to spend a few minutes to talk with me.